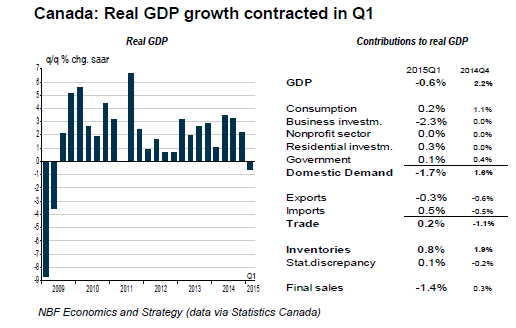 The Governor of the Bank of Canada (BOC), Stephen Poloz, was not kidding when he warned that the first quarter of 2015 would be “atrocious.” After a respectable fourth quarter in 2014, the Canadian economy took a turn for the worse: domestic demand fell by 1.7%, owing to a huge drop in business investment, while the other components of GDP barely registered positive results (see Chart 1). Canada is still suffering from the oil price shock, as much of this drop in business investment is from cancelled oil projects and lowered expected future production. Anticipating a weak first quarter, the Bank of Canada lowered its overnight bank rate from 1.00% to 0.75% in January both as insurance against a particularly bad performance and to weaken the Canadian Dollar. The BOC hoped that lower borrowing costs and a cheaper currency would sufficiently increase capital formation and improve Canada’s trade balance—especially with the U.S—to offset expected energy-related contractions. Did the BOC purchase enough insurance? In a separate survey Statistics Canada said capital spending in the non-residential sector is expected to decline a further 4.9% from 2014, while investment in energy is expected to decline by another 10%. Clearly, cutting the bank rate is not generating the new capital formation that the BOC desired, and it is becoming apparent that Canada cannot count on new investment to turn the economy around. With business reducing investment and consumers spending less, the two major engines of growth are idle at this important juncture. Can Canada rely on exports to revive the economy? Canada has one of the world’s most ‘open’ economies (surpassed only by Germany in the G7), where exports compose about 30% of total national income. Thus, lower export cost should yield strong growth effects. As mentioned above, the BOC weakened the Canadian dollar by cutting rates in January. The Dollar has fallen almost 20% in the span of 6 months and remains under pressure. 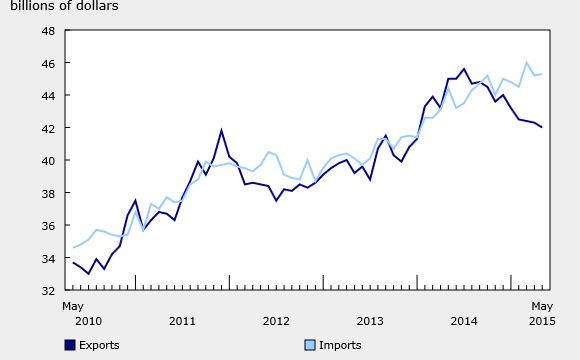 Despite this effort to improve balance of trade, Canada continues to generate widening trade deficits. China’s weakening demand has put renewed pressure on Canadian exports: the export volume of metals and related products are down by 7%; volumes of minerals ore fell by 9%; and energy volumes were down 6.5%. The only bright spot was a modest increase in automotive exports. Overall, the merchandise trade deficit widened to $3.3 billion and Canada ran a trade deficit with the US in May—its first since 1990. Does the Canadian Dollar need to fall further to stem the outgoing tide of widening trade deficits? Economists at CIBC, tried to determine a ‘fair value’ for the Dollar and explain why the currency devaluation has failed to reduce the current account deficit: their model showed that the Canadian Dollar has been overvalued by 10% since 2009. The overvalued currency served as a form of monetary tightening. As the economists conclude: “given that we spent over 70% of the time since 2009 with core CPI under 2%, it shouldn’t be a huge surprise that our analysis suggests that monetary conditions have been tighter than the BOC’s official rate.” * It is apparent from this analysis and recent trends that Canada is in need of monetary loosening. To a lesser extent, a relatively tight monetary policy combined with an overvalued exchange rates are well within in the purview of the policy makers. On July 15th the BOC meets to set the bank rate. Upper most in their minds will be the ‘atrocious’ first quarter and, in particular, the weakness in the external sector, so vital to the health of the Canadian economy. A lot will be riding on that meeting. Stay tuned. To avoid the technical measure of a recession, the economy needs to record increases of 0.2% and 0.3% in May and June, respectively---- a tall order given the performance to date. Analysts are whispering among themselves on the probability of a full recession by the end of the summer.